Last night I fell asleep in my computer chair. I vaguely remember my hand slipping from my desk, the mouse crashing to the floor. The fearsome face of a massive white dragon filled my screen, a dialog box at the bottom indicating he was saying something about how my quest to restore relations between his lizard-like species and the humanoids of Eorzea was futile. I’d been steeped in dragons and moogles and chocobos for hours as I worked my way through The Dravinian Forelands, my latest stop in my grand tour of the Northern reaches of the first Final Fantasy XIV expansion. I’d aided hunters in finding tutelage, witnessed a battle between two gods and gave a young dragon a lesson on Eorzean cuisine. 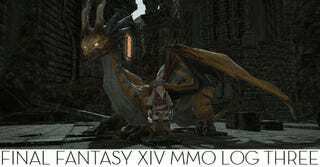 At one point I had feared the Heavensward expansion had lost me, largely due to the massive gaps between the first and second MMO logs. As it turns out, I was just very busy, and the moment I had a chance to dive back in I did so with gusto. My gun-toting Machinist is now level 54, six more to go before reaching the new cap, but I’m in no real rush. There’s plenty to see and do in-between meeting new friends and reuniting with old ones in the expansion’s increasingly engrossing story quests. The most immersive fantasy tale in MMORPG history continues to make me feel like the main character in a single play Final Fantasy game, complete with my own companions and secondary characters. It’s gotten to the point that when another player in my Free Company made a joke about whether or not we had medical insurance for Warriors of Light, it took me a moment to remember that they’re the heroes of their own stories and not just chatty NPCs in mine. Clearly it was Back Front who bested the primal Ravana in this massive battle. An impressive encounter, even if at times it feels as if the developers are beginning to run out of things to do with a powerful boss creature in a circular arena. And it was definitely Back Front who learned how to harness aether currents in order to soar into the clouds atop his majestic steed. Heavensward implemented flying mounts in the best way possible. Players must first scour flying-enabled zones for aether currents—there are ten scattered across each. An additional five are linked to specific quests in each zone, guaranteeing that the player learn the lay of the land before taking to the sky. It’s sort of like the solution Blizzard came up with to ensure Warlords of Draenor players didn’t fly over the good parts of that World of Warcraft expansion pack. Earning that final current and lifting off for the first time is an exhilarating experience. So after a slow start I am playing Heavensward like a fiend, sneaking in a quest every time I get a spare moment and staying up late enough to fall asleep in my chair. I’d say that’s a successful expansion pack. I’m going on sabbatical later this week, spending a month with my children and wife and quite possibly a bit of Canada, but Eorzea will never be far from my fingertips.